At the outset, I wish to convey our gratitude to the President of the General Assembly for convening today’s High-Level Meeting on Addressing the Large Movement of Refugees and Migrants. We have gathered here today against the backdrop of the unprecedented flow of migrants and refugees, across the world. The time has, therefore, come to put into motion, a concerted international response to address this growing phenomenon holistically, and in all its aspects. 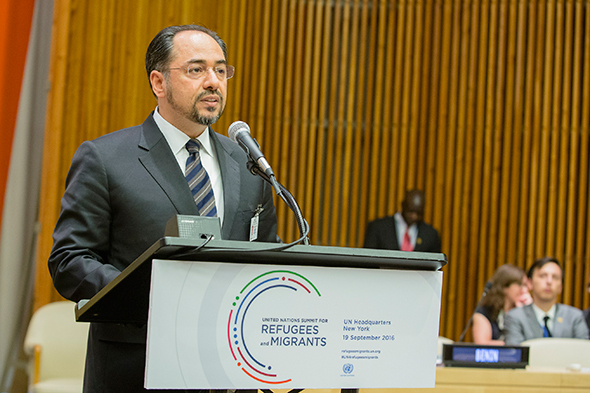 Based on our own experience, Afghanistan is well aware of the complex challenge associated with the issue of global refugees. The legacy of more than two-decades of armed conflict and violence brought about a situation, whereby millions of Afghan women and children were forced to leave their homes and seek refugee abroad. More than 95% of our refugees live in neighboring countries, Iran and Pakistan, and we are grateful for their generosity in hosting our people. Since beginning a new chapter in Afghanistan in 2001, millions of Afghans returned to their homeland, marking the largest repatriation movement in modern history. 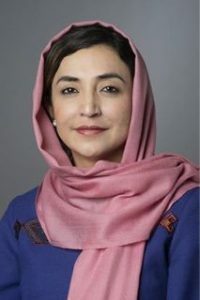 For several years now, the United Nations High Commission for Refugees (UNHCR), and other humanitarian organizations have had the central role in international efforts to support and assist Afghan refugees during some of the most difficult moments of our nation’s life. We are grateful for their support and commitment to address the plight of our refugees and IDP’s. Needless to say, millions of our citizens remain refugees, and continue to face difficult social, economic and humanitarian conditions. In this regard, I would like to underscore the importance of ensuring that all refugees, whether Afghan or of any other nationality – are granted respect and equal treatment by host countries, in accordance with international humanitarian law, and human rights law. As for the case of Afghan refugees they are known to be high achievers in whichever society they have become part of. They have integrated with host communities and strived to achieve success, thereby rendering an important contribution in various spheres of society. We call on all host countries to accommodate their protection and well being. Since its formation two years ago, the National Unity Government has pursued a national and regional effort together with our relevant international partners for a viable and long-term solution to the plight of Afghan refugees, with special emphasis on voluntary return, and sustainable reintegration. To that end, the Quadripartite Commission, comprising Afghanistan, Pakistan, Iran and the United Nations High Commissioner for Refugees (UNHCR), and the Solutions Strategy for Afghan Refugees, adopted in Geneva in 2012, remain the overarching framework, within which the National Unity Government is striving to achieve the voluntary, gradual and dignified return of our refugees, and their sustainable reintegration. 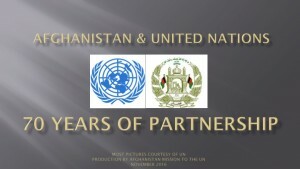 As a matter of equal importance, we are also adamantly focused on addressing the problems faced by our internally displaced persons (IDP’s), which over the past two years, has increased in number, mainly resulting from insecurity in some parts of the country, caused by violence and terror, committed by the Taliban and affiliate groups. Here, I would like to reiterate our appeal to the international community to render a long-term supporting role to effectively address the plight of our refugees and IDP’s. We in the National Unity Government are cognizant that Afghanistan’s social and economic development provides the ultimate guarantee for resolving the challenges facing refugees and IDP’s, in a holistic manner. We are working to improve conditions for our peoples in town, villages and districts across Afghanistan. To this end, we look to the up-coming Brussels Conference on Afghanistan in two weeks time, where we hope the international community will make new pledges of assistance to help us implement our National Peace and Development Framework, which aims at enabling us to achieve self-reliance during the Transformation Decade. We are pleased that today’s high-level meeting offers due focus and attention to addressing the root causes of migration, at the global level. In most cases, those who resettle do so not as a matter of choice but of circumstances. Poverty, conflict and a lack of economic opportunities are some of the main factors, leading to resettlement. In this regard, the central role of the UN will remain of strategic importance in providing support across a wide-spectrum, including development assistance; conflict-prevention; systems development, as well as in peace-building and national reconciliation. The adoption of the SDG’s, last September here in New York was a milestone, charting a new development framework over the next fifteen years. The implementation of the SDG’s will go a long way in helping to ensure peace, security and a stable economic environment in countries of origin, offering an incentive to people and families to avoid resettlement. After settling in their country of destination, migrants and refugees are presented with both opportunities and challenges. Many are able to broaden their horizon, and benefit from a new experience and environment where they could live free from violence, conflict and often times, persecution and improve their plight, and that of their families. Having said that, far too often, their new experience is not void of difficulties. We must bear in mind, that among those who resettle, there are those who bring with them unique skills and creative ideas that serve as positive factors, for the development of stable and healthy societies. We must perceive diversity as a source of strength and optimism, rather than seeing it from a negative perspective. After all, humanity is one; irrespective of our cultural, religious and geographical differences. We all aspire towards the same goals: the chance to live in peace, to prosper, and above all, to ensure a better and brighter life for our children and future generations. Today’s Summit is a fitting opportunity for all of us to reaffirm our shared commitment to protect, and promote the rights of all Refugees and Migrants, and to do so in adherence to the UN Charter, and the Universal Declaration of Human Rights. 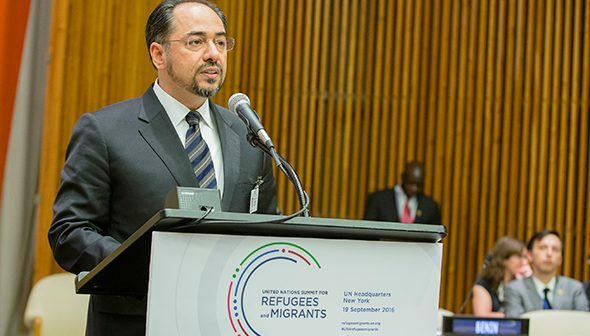 Afghanistan welcomes the adoption of the Conference Declaration and its two annexes: the “Comprehensive Refugee Response Framework, and “Towards a Global Compact for Safe Orderly and Regular Migration.” Let us leverage the full range of resources at our disposal, and expand our collaboration to address all aspects related to the increased flow of migrants and refugees, across the globe. Before concluding, I want to convey our gratitude to their Excellencies David Donoghue, and Ms. Dina Kawar, Permanent Representatives of the Republic of Ireland and the Hashemite Kingdom of Jordan, for so ably leading the inter-governmental negotiations on our Conference Declaration!